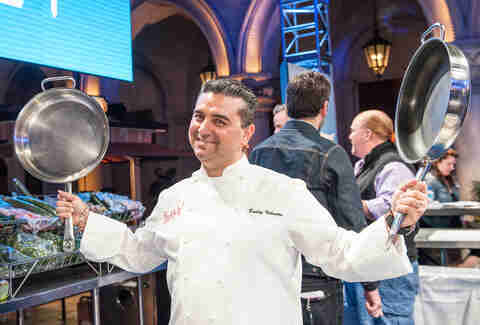 His over-the-top cake creations have garnered worldwide attention, and due to his handful of shows on TLC, Buddy Valastro is one of the most recognizable names on our list. The "Cake Boss" has given Las Vegas a cool Italian spot with Buddy V's Ristorante (try the brunch) at the Grand Canal Shoppes, but it's his Carlo's Bakery dessert shop across the hall that generates long lines of people eager to get their hands on the cream-filled lobster tails and rich cannolis. Although he serves food that's meant for everybody, he's become the guy who isn't quite for everybody. However, this Las Vegas native and UNLV grad has been drawing huge crowds ever since he finally opened his own restaurant at The LINQ. Guy Fieri's Vegas Kitchen & Bar is the kind of place where burgers come with mac & cheese on top and the chicken wings are infused with Fireball cinnamon whiskey. Fans of Diners, Drive-Ins and Dives love this kind of stuff so much, Fieri also opened a Mexican spot, El Burro Borracho, at the Rio earlier this year. The TV darling was famous on the Food Network long before she opened her own restaurant, and when she finally did -- it was in Las Vegas. 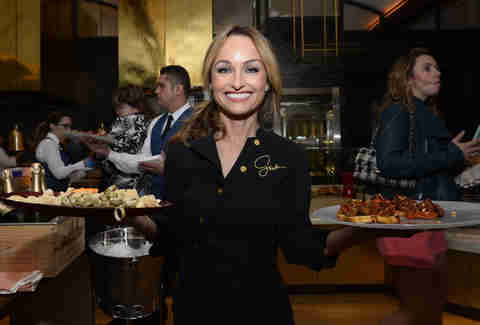 Giada at The Cromwell is still her only dining establishment, underscoring the importance of our neon city in the culinary world. It's proven to be a big hit, with a bright dining room and windows that open up wide to an air-filled view of the Strip. For a lot of tourists, this is the first restaurant they want to visit in Vegas. 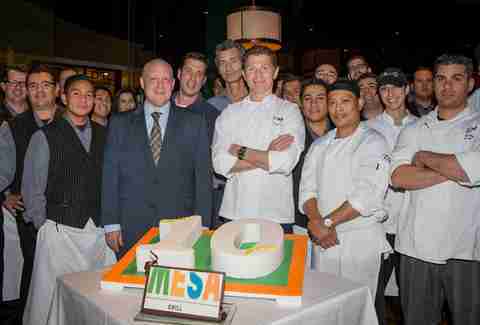 The Iron Chef veteran made a big impact with Mesa Grill at Caesars Palace, earning rave reviews and eager fans for more than a decade. 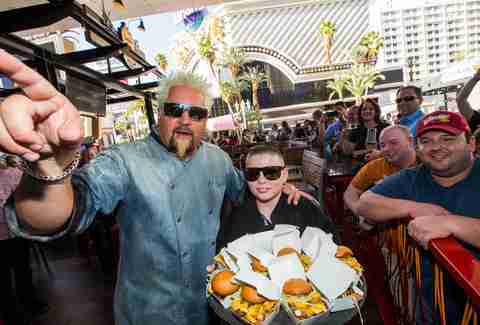 His only other Vegas venture is Bobby's Burger Palace, which has close to 20 other locations around the country. Suddenly, Vegas doesn't feel so exclusive anymore... although we still love the burgers with potato chips on top. 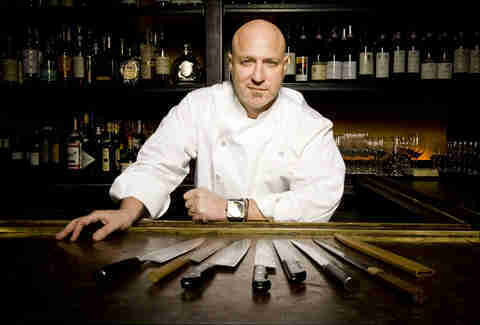 As the head judge on Bravo's Top Chef, Tom Colicchio has very little wiggle room to make mistakes. No worries. He has not one, but two steakhouses that genuinely stand out from the crowded field of choices on the Strip. Craftsteak at the MGM Grand and Heritage Steak at the Mirage are just two examples of why the chef has earned five James Beard awards. He may look like a Jedi master, but Pierre Gagnaire really is one of the top culinary masters in the world. 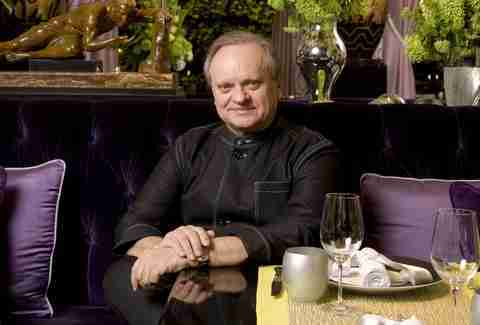 His global invasion of restaurants stopped short of America, until he opened Twist at the Mandarin Oriental in Las Vegas. The Frenchman's understated elegance fits in nicely with the hotel. No casino. No nightclub. No self-parking, even. Just leave your keys with the valet and head to the 23rd floor for an amazing view of the Strip and a multi-course dinner from one of the best. 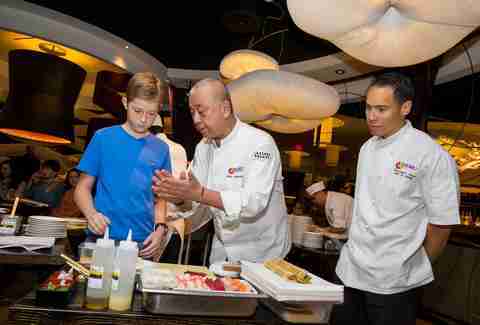 As one of the most influential chefs in the game, the man known simply as Nobu can be credited with popularizing dishes like the now-common miso black cod, as well as having two namesake restaurants in Vegas. The one at the Hard Rock sometimes goes overlooked, but the flagship location at Caesars Palace comes with its own hotel-within-a-hotel. Awe-inspiring restaurants and a hotel named after you? Somebody's doing something right. 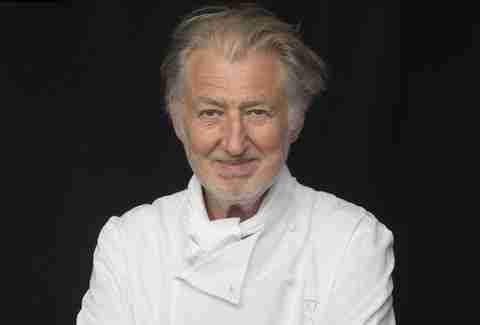 If that wasn't enough, Nobu has partnered with Robert De Niro in his business ventures and dabbled in acting, with small parts in Casino and Austin Powers in Goldmember. Guy Savoy has five fine dining restaurants: four are in Paris… and one is in Las Vegas. Restaurant Guy Savoy at Caesars Palace could easily serve up the best meal you'll have all year, given that it offers exceptional French cuisine and one of the best serving teams on the Strip. 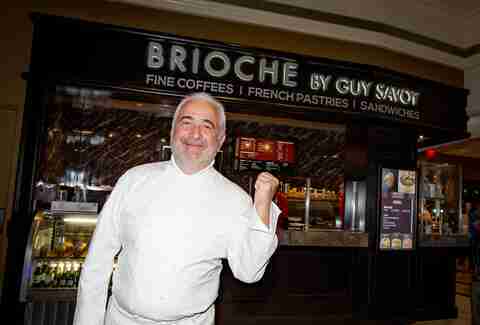 He has also recently opened Brioche, a grab-and-go pastry and sandwich shop, also at Caesars Palace. Savoy could be higher on the list down the line -- if he opens more restaurants and makes a broader cultural impact in the US. 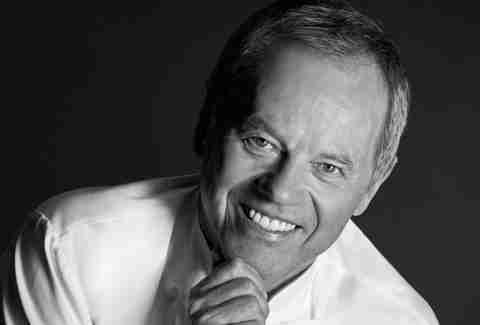 Wolfgang Puck was famous for his cooking long before the term "celebrity chef" became a thing. His empire spans across the country as well as global destinations like Istanbul and Bahrain, so it might be easy to overlook his six (yes, six) dining destinations in Vegas. They range from CUT, a steakhouse at the Palazzo, to Spago at Caesars Palace, a reincarnation of his original LA restaurant. 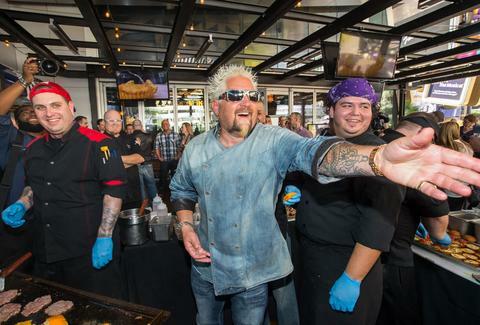 He has even extended his reach into the suburbs, with a casual bar and grill at Downtown Summerlin. Add in numerous appearances in TV and film over the years, and he's almost too omnipresent -- if that's possible -- to feel like an "only in Vegas" experience. 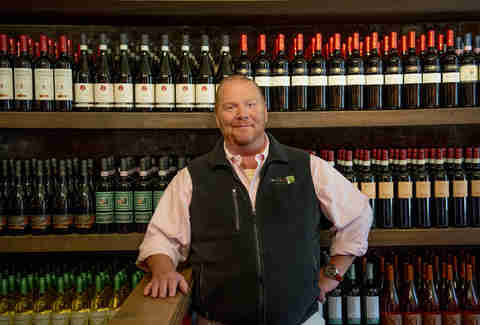 The Louisiana native scores high on the list due to his longevity, as well as the variety and quality of his creations. Emeril Lagasse's New Orleans Fish House has been at the MGM Grand for more than 20 years now (which might as well be a hundred years in Las Vegas terms) and is still competitive, with frequent menu updates. The chef who made "Bam!" a common kitchen phrase can also boast the whiskey-soaked Delmonico Steakhouse at The Venetian, and over at the Palazzo, Table 10 and the Lagasse's Stadium sports bar. In a town where it's not easy to single out steakhouses, we named Carnevino the best of them all. 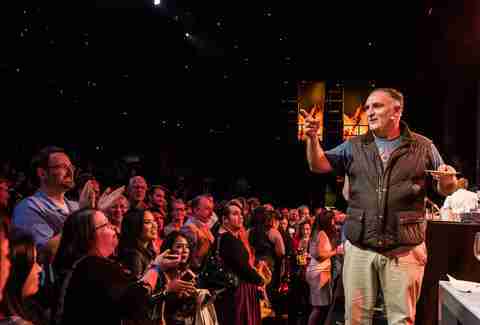 The praise is well-deserved for Mario Batali, who along with partner Joe Bastianich has an impressive Italian-American empire at the sister Venetian and Palazzo resorts. B&B Ristorante offers fine dining elegance, while B&B Burger & Beer goes for the casual crowd. Meanwhile, OTTO has the best wine list you'll find at a pizza place anywhere on the Strip. The network TV megastar is probably the most well-known chef on the list, and a strong asset to the culinary reputation of Caesars Entertainment. Ramsay has a steakhouse at Paris, a pub at Caesars Palace, and a burger joint at Planet Hollywood. Each one serves a different purpose, but they're all excellent at what they do. He also has a Fish & Chips spot opening soon at The LINQ. 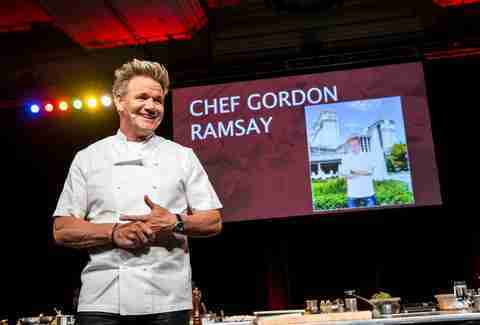 Despite the aggressive personality that's played up on shows like Hell's Kitchen, Ramsay is open and engaging in person, a true ambassador for not only Caesars Entertainment, but also the very best of what Las Vegas has to offer. He collects Michelin stars like Guy Fieri collects sunglasses, yet somehow the man named "Chef of the Century" (by a French restaurant guide, although the tag tends to stick) only has two restaurants in the entire Western Hemisphere... and they're both right next door to each other in Las Vegas, at the MGM Grand. A visit to Robuchon's eponymous restaurant feels like a private meal inside an extravagant mansion, while L'Atelier is slightly more casual (and slightly less expensive) while offering an interactive experience for those sitting at the counters around the open kitchen. Here's the deal with Michael Mina: he has four distinctly different restaurants in four different Las Vegas casinos, and they're all absolutely awesome. 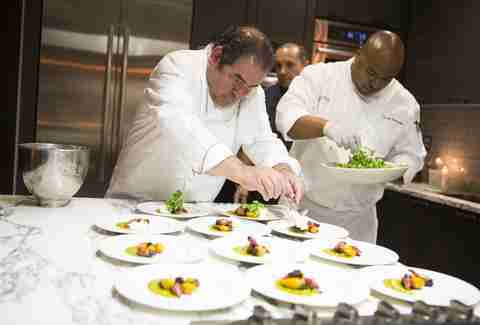 His self-titled restaurant at the Bellagio first opened as Aqua way back in 1998, helping to shape the future of fine dining on the Strip. He also has Bardot Brasserie for French cuisine at the ARIA and Stripsteak at Mandalay Bay, which offers a modern, energetic response to the classic Vegas steakhouse. If you want something more casual, Pub 1842 is a sports bar at the MGM Grand where you can order a burger with peanut butter on top. 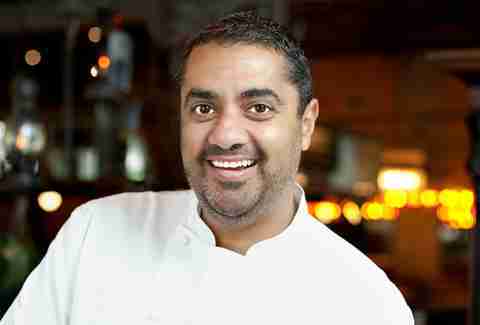 Perhaps more than any other chef on this list, Mina proves he can truly do it all. While he may not be as famous as some other names on the list, he could be the most well-rounded package. Variety, quality, and inventiveness from this influential Spanish chef places him at the top of our list. Bazaar Meat, his latest Las Vegas venture, is the flagship dining spot for the SLS resort, offering an innovative spin on the familiar steakhouse concept. He also has three destinations at the Cosmopolitan. Jaleo perfects Andrés' reputation for Spanish tapas and paella, while China Poblano mixes Chinese with Mexican on the same menu. é by José Andrés is an entirely different concept all to itself, taking reservations months in advance to serve a carefully crafted dinner -- of at least twenty courses -- to one small party at a time. There's really no one else doing what this guy does. Andres has made more than a few TV appearances over the years, was named one of Time's 100 Most Influential People, and even got into a public legal battle with Donald Trump over presidential campaign rhetoric. It squashed plans for a Washington, DC restaurant partnership between the two but hey, it's nothing to worry about. There's always Las Vegas. Rob Kachelriess has been writing for Thrillist for nearly three years. He never spells "Lagasse" right on the first try. Follow him on Twitter @rkachelriess.